“Economic crisis” and “festival” are two terms that feel counterintuitive together, although the former both impacts and overshadows the latter. So it follows that if you haven’t heard of the techno-oriented Reworks Festival, Greece’s economic crisis following the global recession of 2008 may be the reason. Running a festival is hard enough, even in places with government-funded cultural budgets—which in Europe is a fairly high number. Imagine the difficulties in a country subjected to strict austerity, where over the course of seven straight years of recession salaries have dropped dramatically, unemployment and homelessness have skyrocketed and businesses have shuttered in record numbers. Reworks, the country’s only electronic music festival to speak of, has taken place every mid-September since 2005 in the ancient port city of Thessaloniki, which overlooks a bay tucked into the top of the Aegean Sea. Founded in 315 B.C.E. by a Macedonian king, it’s been a constant economic, political and cultural hub for whichever empire presided over it. Now with approximately 1.2 million inhabitants, it’s the second largest city in Greece. Wandering as a tourist in Thessaloniki’s city center, you’ll find a bustle of people, many bright, shiny stores and busy restaurants and cafes. While it gives the impression of normalcy and business as usual, Kosmas Efremidis, co-owner of the long-standing (and beautifully designed) Stereodisc record shop, spells things out for me more clearly. “You have to define recession,” he points out. “Is it like the day after war, like a bombing in Beirut? Or is it a crisis that hits people but not all of them, or at the same time? “Athens was hit far more than Thessaloniki, because it’s the economic center of the country,” he continues. “Salaries in Thessaloniki were maybe only a third of salaries in Athens to begin with. So [the recession] hit the richest, most populated parts of the country first. Athens salaries dropped maybe 50 percent, but here the drop was perhaps 30 percent.” While Efremidis isn’t an economist, he is a small business owner in the city he grew up in. If Thessaloniki was spared the worst margins of the economic crash, its location in the north of the country has also saved it from being forced to wrestle with Greece’s part in the refugee crisis. But signs of strain are apparent even to a visitor: on the weekend of the festival, the city’s bus system went on strike to settle over four months of unpaid wages. At time of writing, nearly two weeks later, they remain on strike. These kinds of knock-on effects touch everyone there. As festival co-founder Anastasios Diolatzis reveals, the city’s investment into Reworks has unsurprisingly dwindled to a few thousand euros—enough to pay for two free-to-the-public programs in 2016’s edition: a stage in a city center square on the Friday evening and a few film screenings during the week. More surprisingly, the most they ever received was seven or eight thousand euros from the city—in 2007, right before the crash—with no funding ever coming from the country’s coffers. In fact, the festival has been almost entirely independent from day one, and has grown larger almost every year. The only year they did not grow either in venue size or length (the first event in 2005 was one day) was 2015, when, following a national referendum on bailout conditions imposed by European troika (the EU representative body comprised of the European Commission, the European Central Bank and the International Monetary Fund), the banks were closed. If the drug culture reputation that’s become synonymous with electronic music preceded the festival itself, it feels distant enough at the actual event. You’d be hard-pressed to find even one person appearing out of control at Reworks’ two-room Friday night event this year, or even at the seven-stage Saturday night blowout. A group of Irish lads approach us on the hunt for drugs, only to confess no luck in finding anything when we run into them again the following night. But the primarily Greek audiences are clearly enthusiastic and warm without chemical aid, prompting grateful social media updates from performing artists such as KiNK and Anja Schneider. “We are all music freaks,” shrugs Diolatzis, speaking about his festival colleagues. “We all spend hours and hours in clubs without taking anything. We have this mentality that you don’t need it to have a good time, to appreciate the music. On the mentality of the people, the connection between drug use and the music is not as strong as perhaps in other places. The people here don’t think, ‘I have to take something in order to have a good time.’” While that’s probably partly due to the fact that Greek going-out culture dovetails naturally with club culture—especially in terms of the late-night time frames—it’s still the case that while the festival boasts interesting venues, good sound, and solid programming, one of the best things about it is the crowd. Friendly, polite and engaged, every night has a relaxed vibe that’s replicated in most interactions in the city itself, as well as on site. At the moment, the vast majority of this community comes from Greece; Diolatzis estimates the 2016 edition to be 10 percent international visitors. 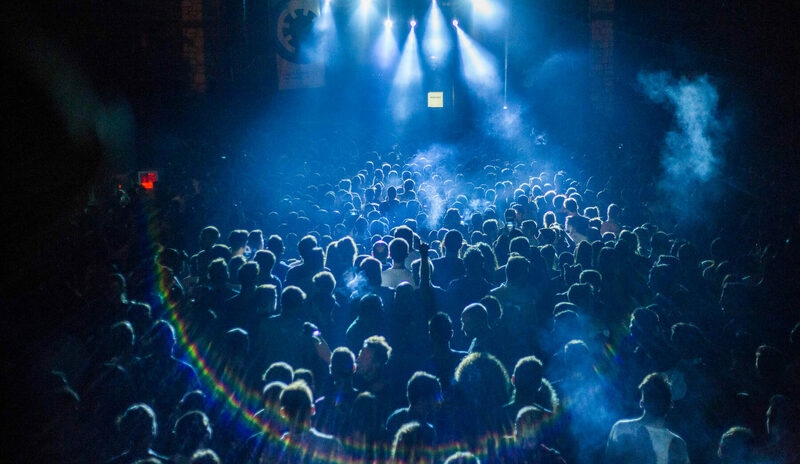 But 2016 saw Reworks benefit from membership in a new community, a collaboration of eight different festivals, including Spain’s pioneering Sónar, called We Are Europe. And while Reworks has never received aid from an EU body, this distinctly European initiative helped to create—both in funding and ideas—the festival’s first discourse strand, as well as bringing in artists from their respective homelands and providing the platform for Reworks to do the same, not to mention increased international visibility. In a time where festivals are reliant upon corporate sponsorship—Reworks is like many a festival with inescapable drinks branding—this kind of support outlet sounds especially valuable in idea-exchange alone. “Maybe it will sound a bit naive, but with We Are Europe, we felt all our efforts mean something, in a way,” Diolatzis reveals. When the 2015 national referendum result called to reject another bailout, due to the further harsh austerity rules it demanded, it was largely seen as a renouncement of the EU. But ultimately, the Syriza-led government declined to follow the public mandate in a blow to the country’s pride that was generally agreed upon as the prudent move, preventing a crippling economic decline from becoming even worse. And on the long, painful road to recovery, tourism—another aspect of cultural exchange—is the one industry on the rise in Greece.